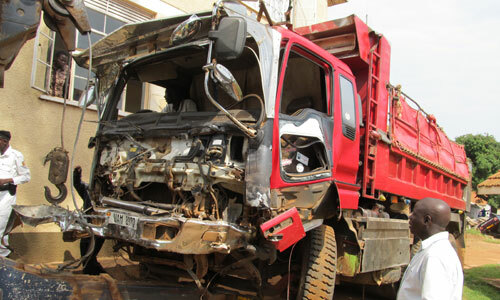 The death toll from the early morning accident that occurred along Entebbe Road has risen to five. This is after one of the two police officers that had been rushed to Mulago hospital in critical condition died a short while ago. 3 police men and one suspect died on the spot earlier after the patrol vehicle in which they were travelling overturned. The suspect was being rushed to hospital for treatment and the accident occurred at Sese Gate way. The District Police Commander Entebbe Edward Nyabong says the accident was due to slippery driving that saw the car skid off the road before ramming into a lorry. He has identified the dead as Corporal Geoffrey Bogere, and Constables; Fred Mwekwasize, Julius Balazewa and Moses Saloki the driver. While the other officer still fighting for his life at Mulago Hospital has been identified as George Kilama. All the affected police officers are attached to Entebbe police station.